Blessed with overwhelming beauty, Croatia is becoming number one destination for world wide travelers. Though there are many reasons on why you should visit – miles of stunning coastline, wealth of culture and great food, exploring it’s beautiful National parks is one thing that you must include in your itinerary if you choose to visit this country. Here is an overview of the most popular Croatian National parks. Brijuni is located on the western Istrian coast and consists of 14 islands and islets, covering an area of 7.42km2. One amazing feature of the Brijuni archipelago is the biological diversity, made by the diversity of the habitat, island location, geographical location, geological base and geomorphology. You can have a sightseeing tour which includes a train ride, a visit to the Roman villa rustica, dating from the 1st Century B.C. You can also take a safari in the park to see many wild animals and such as the elephants, zebras and Somali sheeps. Mljet is a beautiful island located off the coast of Dubrovnik and is often referred to as “The greenest island” in Croatia. It’s a large island consisting of bays, villages and 2 lovely sandy beaches – Blace and Saplunara. The national park is on the northwestern part of the island. Other interesting features of the islands include 2 salt water lakes and the St. Mary islet, which has a monastery on it. If you are getting there by car, you can catch a ferry from Prapratno, Peljesac. Alternatively, you can take a boat from Dubrovnik’s ferry terminal. The islands that were made a national park in 1980, endowed with an extremely beautiful landscape consisting of a highly jagged and indented coastline. The Kornati archipelago is a great attraction for mountaineers, yachtmen, mountaineers, divers and other nature and activity lovers. You can get to the islands by organized tours or charter a sailing boat and discover the islands by yourself. 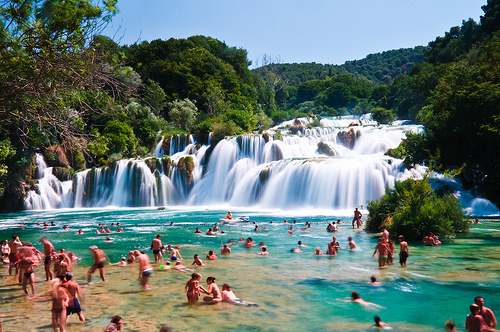 Krka National Park is endowed with natural sceneries that are unmatched anywhere else in the world. A major attraction here is the series of waterfalls. The most spectacular one is Skradinkski Buk. Krka river cuts through a dense woodland and a gorge shaded by limestone cliffs, creating a series of spectacular pools and waterfalls. You can come to the park from Sibenik by bus, to the town of Skradin. From here, you can take a 25-minute boat ride up the Krka river. Plitvice National Park is considered to be one of the most beautiful natural sights in Europe. There are hotels, restaurants and campsites inside the park, so you can have a comfortable and relaxed visit. People are attracted by the numerous waterfalls, a bevy wildlife, including fish, frogs and a variety of bird species. Special attractions at Plitvice, include the Veliki Splat, a 100 foot waterfall. Included in the price of admission to the park you can travel up the lake on electric boats and then hike around the waterfalls. This national park is probably the most popular national park in Croatia, counting several thousands of visitors every year. A decision to visit one or more of these national parks will offer you an unforgettable experience that will remain edged on the back of your mind for the rest of your life. Therefore, you should consider booking your travel today! Mary is a freelance journalist. She cover travel and lifestyle topics. Her area of expertise include interior design, travel and luxury travel, home, family and health.